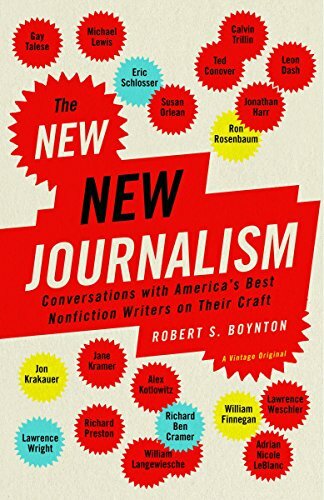 Forty years after Tom Wolfe, Hunter S. Thompson, and Gay Talese launched the New Journalism movement, Robert S. Boynton sits down with nineteen practitioners of what he calls the New New Journalism to discuss their methods, writings and careers. The New New Journalists are first and foremost brilliant reporters who immerse themselves completely in their subjects. Jon Krakauer accompanies a mountaineering expedition to Everest. Ted Conover works for nearly a year as a prison guard. Susan Orlean follows orchid fanciers to reveal an obsessive subculture few knew existed. Adrian Nicole LeBlanc spends nearly a decade reporting on a family in the South Bronx. And like their muckraking early twentieth-century precursors, they are drawn to the most pressing issues of the day: Alex Kotlowitz, Leon Dash, and William Finnegan to race and class; Ron Rosenbaum to the problem of evil; Michael Lewis to boom-and-bust economies; Richard Ben Cramer to the nitty gritty of politics. How do they do it? In these interviews, they reveal the techniques and inspirations behind their acclaimed works, from their felt-tip pens, tape recorders, long car rides, and assumed identities; to their intimate understanding of the way a truly great story unfolds.